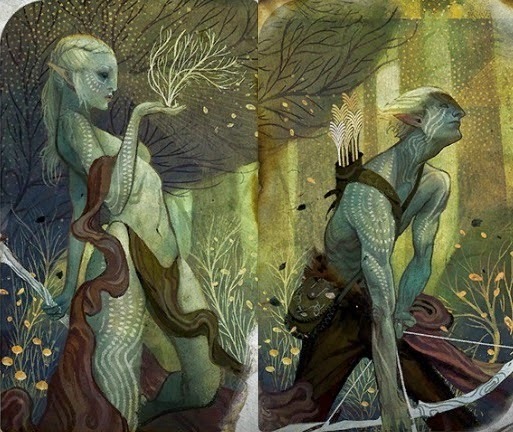 My latest PopMatters article is up on race, and sort of why being an elf is the best way to play Dragon Age: Inquisition. Not really. The game is probably great as a Dwarf or Qunari too. This article largely speaks to the game from my own perspective and experiences, but I suspect Bioware has included enough diversity in their game for nearly anyone to relate to some significant game narrative. For example, I hear playing as a mage is interesting in that the war between Templar and Apostate is that much more personally significant. The mage/Templar conflict, especially as it touches the Chantry and other organizations in Thedas, is fascinating and delivers some genuine heartfelt story beats. For those not playing an elf or who cannot related to that side of the story, I can see why some of the characters tied to that narrative are uninteresting. Like many others, I too though Solas boring and Sera annoying at first. As the game continued, each revealed unexpected aspects of themselves. Solas now appears more measured and calculating than before. He's not just some elven history fanatic. Likewise, Sera's at times silly and aggressive attitude has become, to me, an understandable hostility towards all the elements of society that attempt to conform her into a mold. She's a "wild card" because she is rebelling against being a one-note character. I find that refreshing in games. Having a stake in these characters and the lore behind their lot in life also enriches some of the smaller elements of the game. Yesterday I found myself in lands that one belonged to the Dalish and have since been ruined by warfare and demonic rifts. More than in any other environment, I took my time exploring and reading the historical texts dotting the landscape. I was taking lessons from my own life, the fictional life of the Inquisitor, and the perspectives of her companion. It was easy to see the tragedy written across the ancient battlefield, but I also knew the elves survived and transformed like any other peoples. I thought of that great quote from Drink Cultura: "Mexico never left the Southwest, it just learned English." I know how talking about this kind of stuff can sound flippant, but I do find something special about Bioware's handling of these personal themes.